BIG WOLF TREND is a ready-made solution for trading on the market trend movements. BIG WOLF TREND is good documented. You can DOWNLOAD the MANUAL and read it before buying. Thus, BIG WOLF TREND is a semi-automated trading system that performs almost all analytical and technical tasks. All that is needed from a trader is to follow the indicator signals and open trades in time. Security – the indicator shows where to place the Stop Loss, which will protect you from large losses in each deal. Clear goals – the indicator shows where to place Take Profit, and you don’t need to follow open trading positions to close them manually. Diversity – the indicator can work on any currency pair, stock index, commodity asset or cryptocurrency price charts. Any time frames – the indicator works on any timeframe from M5 to D1. 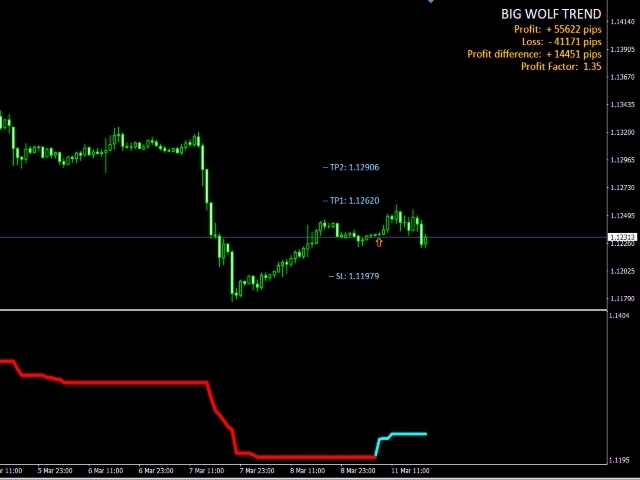 Using BIG WOLF TREND, you can trade intraday (by scalping on charts with M5-H1 timeframes) or make long-term deals (by trading on H4 or D1 timeframes). Clear statistics – the indicator shows its effectiveness on different assets and timeframes in advance. Huge potential – the indicator can be an effective analysis tool for you for many years. Flexibility of settings – changing the manual settings of the indicator yourself, you can adjust its profitability at different stages of the market. Also, I have prepared for you several set-files for setting the BIG WOLF TREND on the most popular trading assets.